Singapore-based startup Zopim is responding to the growth in mobile-based Internet browsing after it released a mobile-optimized version of its customer-business chat service to help companies better engage with website visitors and increase conversion rates. Zopim is concerned with helping businesses turn visitors to their website into customers. It provides a live chat service which pings up on a company page to give visitors an opportunity to interface with staff if they have questions or need help. 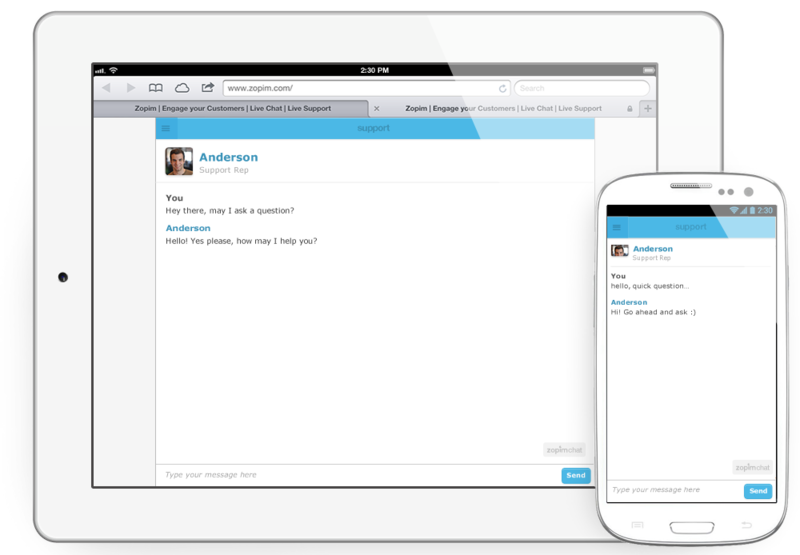 Unlike automated chat services, Zopim connects actual staff to website visitors. The company says its service is installed on more than 100,000 websites, which serve 1.5 billion page impressions per month. Now the company is rolling out a mobile-optimized client — previously in beta — in response to the growth of the mobile Internet and because, its founders say, none of its rivals offer a quality experience for mobile. Zopim has seen mobile traffic to its customers’ websites grow from just 1 percent of visits in 2011, to 10 percent at the end of 2012, further indicating the opportunity. The mobile widget, as it is called, has been tested across smartphones and tablets that run iOS, Android and Windows Phone. It is designed to provide the experience of a native app and is optimized to fit with varying screen sizes. Royston Tay and Qing Ru Lim — two of the company’s four co-founders — tell TNW that, with the average sale conversion rate still below 10 percent on mobile, the goal of the widget is to empower companies to provide a better mobile Web experience that caters for prospective customers. They say that Zopim itself has benefited from the widget, with its sign-up rate increasing 5 percent after rolling it out. But mobile is a two-way street and the company is making it easier for companies to access the service from smartphones and tablets. It has released apps iOS and Android (which is described as being “alpha”) that allow Zopim customers to interact with their customers that are using the live chat service from any location. That makes it a pretty powerful tool, with the potential to make customer service as easy as chatting with friends over WhatsApp, and far less clunky than email. The basic version of Zopim is available for upwards of $14.00 per month per agent ($25 per agent buys an unlimited package), with a 20 percent discount for a one-year package, and 30 percent discount for a two-year commitment. In addition to supporting smartphones, Zopim’s mobile solution also supports tablets. That is important, according to Tay and Lim, who say that the average spend per customer is higher on tablets than desktops, demonstrating the potential benefits that a more optimized customer relations solution can bring. “Most third-party widgets do not work on mobile platforms. Those that do are not optimized for the varying screen sizes and resolutions, which is problematic for both companies and their customers,” Lim says. Further reading: Head over to Tech In Asia for a good background article on Zopim and how it began in the US.